Sunny will host Food and Finance High School’s Annual Gala Small Plates, Big Hearts on March 3rd in New York City. She’ll be joined by Bobby Flay as well some of New York City’s top restaurants to benefit the school. Tickets are now available here. For more info, read below! 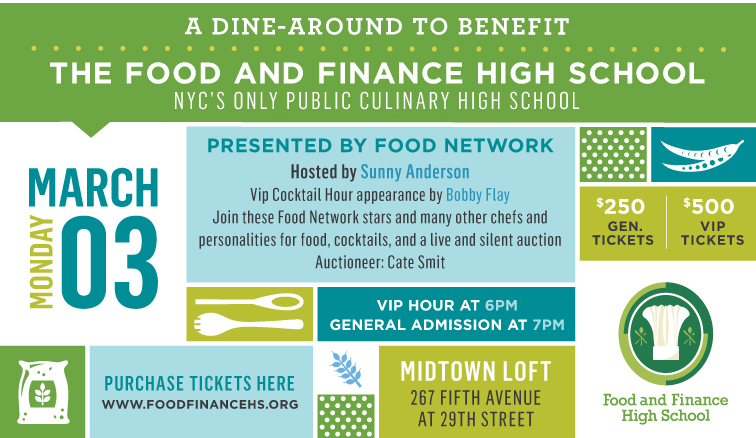 Food & Finance High School, New York City’s premiere culinary arts high school, today announced that Sunny will host their annual gala fundraiser, Small Plates, Big Hearts. The gala will be held Monday March 3 at the Mid-Town Loft on Fifth Avenue and 29th street. Food Network is the presenting sponsor of the event. Sunny will put her hosting skills to work as she welcomes foodies and philanthropists alike to join some of her TV colleagues as well as many of the city’s most well respected culinary talent to SMALL PLATES, BIG HEARTS BENEFIT. The event will include a silent and live auction and take place in the mid mall pop up space. Bobby Flay will join for the VIP cocktail hour, and guests will be treated to food created by some of the city’s top restaurants. Confirmed restaurants include: Blue Ribbon Sushi, Blue Smoke 27th street, Cafes at Moma, Food Network Kitchen, L’Apicio, mokbar, The Smith, Union Square café, Union Square Events, Untitled at the Whitney and the Students of the Food and Finance High School. “We are so fortunate to have partners in the talented culinary community of NYC who use their celebrity to assist us in keeping our school’s mission front and center. Our students really are the future of this industry and helping them work toward their passions is a magical thing to watch grow.” Says Roger Turgeon, the principal of the Food and Finance High School. “I’m thrilled to host this gala on behalf of the Food and Finance High School. I love being part of an event that’s helping tomorrow’s chefs and food professionals. 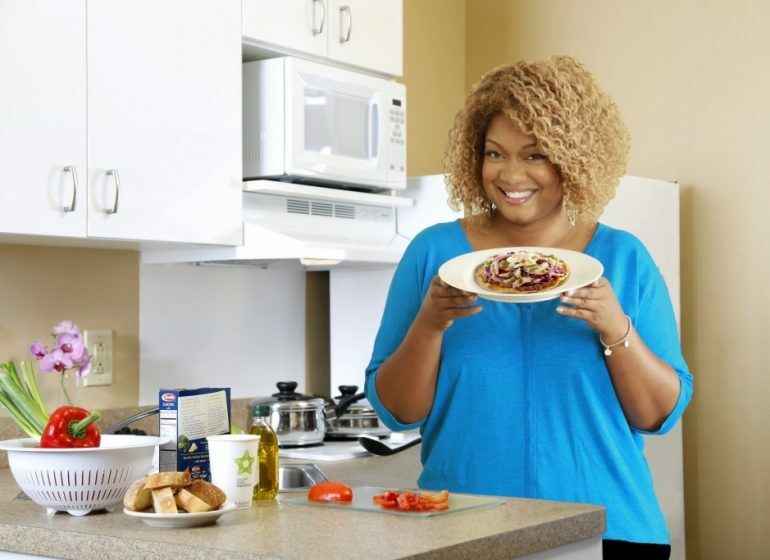 These students have big dreams and ambitions, and we’re doing what we can to help make them real.” Says host Sunny Anderson. All proceeds of the SMALL PLATES, BIG HEARTS event will benefit the Food and Finance High School scholarship fund, as well as support the Food and Finance High School afterschool program combining healthy snacks, academic support, culinary training, and an entrepreneurial program running a student run café. Established in 2004, the Food and Finance High School offers a full academic program as well as four years of intensive culinary training, preparing the students for college as well as the real-world workplace. 90% of the high school graduates go on to a four year college, an amazing statistic for any school. Food and Finance High School, partnered with Cornell University, runs hydroponic, aquaculture, and aquaponic labs right in the building, affording these passionate students cutting edge science education. The Food and Finance High School basement is also home to 10,000 tilapia, an example of just one of the innovative programs that have drawn many high profile chefs to support the school’s mission. N.O.R.E. (aka P.A.P.I.) 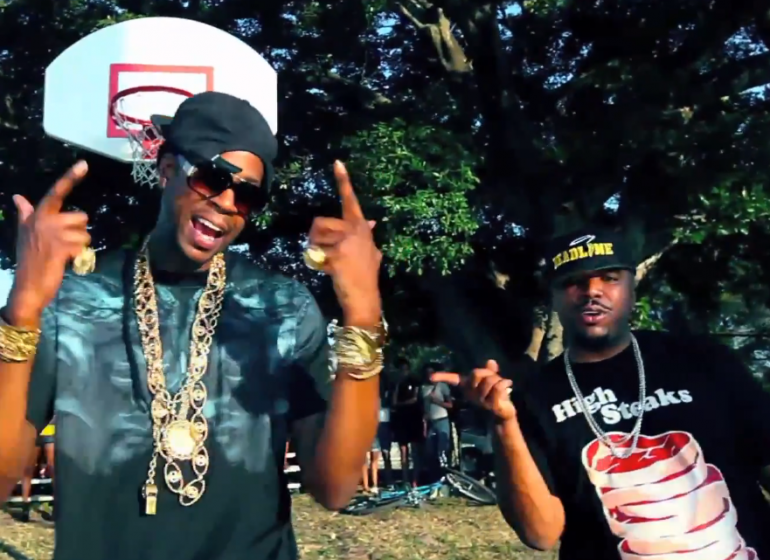 wears Sunny Anderson’s High Steaks shirt in his new video for “Tadow”!